And after his good work, God looked down on his paradise and said, “I need more than a caretaker.” So God made a Rancher. God said, “I need someone willing to start the day early, send the spouse off to the second job in town, feed the cattle, work all day on the land, feed the cattle again, eat supper and to improve the chance of small famer success, spend the evening providing volunteer help to the Rancher’s Coop.” So God made a Rancher. “I need somebody strong enough to rustle a calf and yet gentle enough to give love and comfort to grandchildren. Somebody to call the cattle, run the machinery, come in hungry, but wait lunch until the Postman’s done with the latest gossip and tell him to take care – and mean it.” So God made a Rancher. 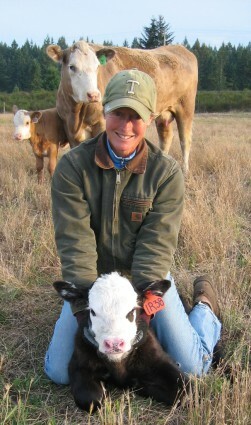 God said, “I need somebody willing to sit up all night with a newborn calf. And watch it die. Then dry the eyes and say, ‘Maybe next time.’ I need somebody who can shape a cattle prod from an oak branch, tube a steer with a pipe and funnel, who can make a harness out of baying twin, and move a sick animal using a pallet and chain. And who, at calving time and winter feeding, will finish the forty-hour week by Tuesday noon, then, pain’n from loading a ton an half of hay each day, put in another seventy-two hours.” So God made a Rancher. God had to have somebody willing to ride the gator at double speed to get the harrowing done ahead of the rain clouds and yet stop and race to help a colicing horse in the next field. So God made a Rancher. God said, “I need somebody strong enough to clear brush and heave bails, yet gentle enough to tame a colt and wean cattle, tend to disoriented calves, and still stop to help a lost kildee. It had to be somebody who’d love the land and not cut corners. Somebody to seed, weed, feed, breed, rotate the fields, plant the garden, cook and replenish the self-feeders. And finish a hard week’s work with long talks with family and friends. “Somebody who’d hold a family together with the soft strong bonds of sharing, who would laugh and then sigh, and then reply, with smiling eyes, when one of the family says with respect and honor they hope more than one of them can do ‘what Mom does.’ “So God made a Rancher.